You are currently browsing the tag archive for the ‘help’ tag. This is the best I can do for a “before” photo. 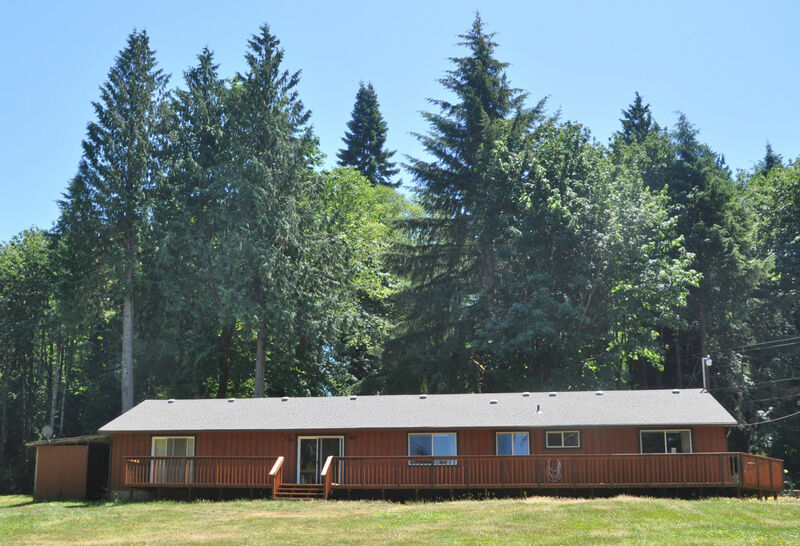 The shed is on the left side. 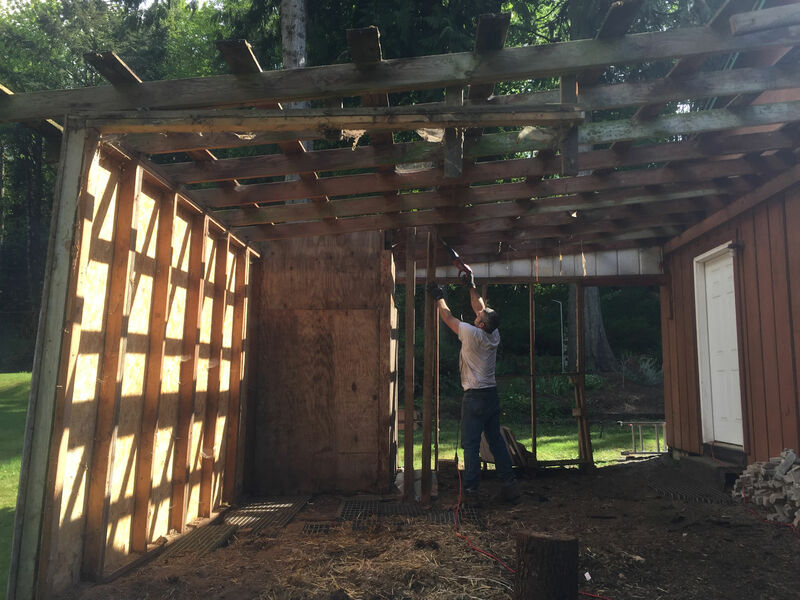 There was an old lean-to shed built up against the side of the house. I didn’t like the looks of it or the location, and had been telling people for years that I wanted it torn down. As with so many other things around here, Josh took care of it. 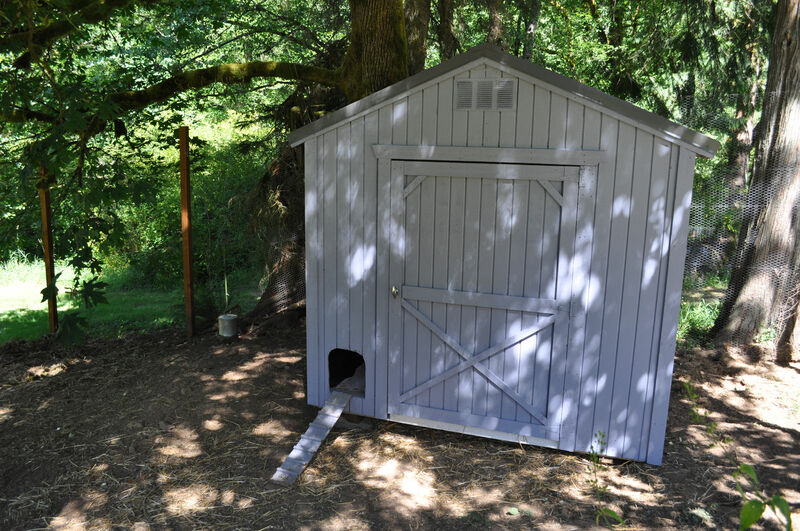 One problem was that the shed also contained my well. 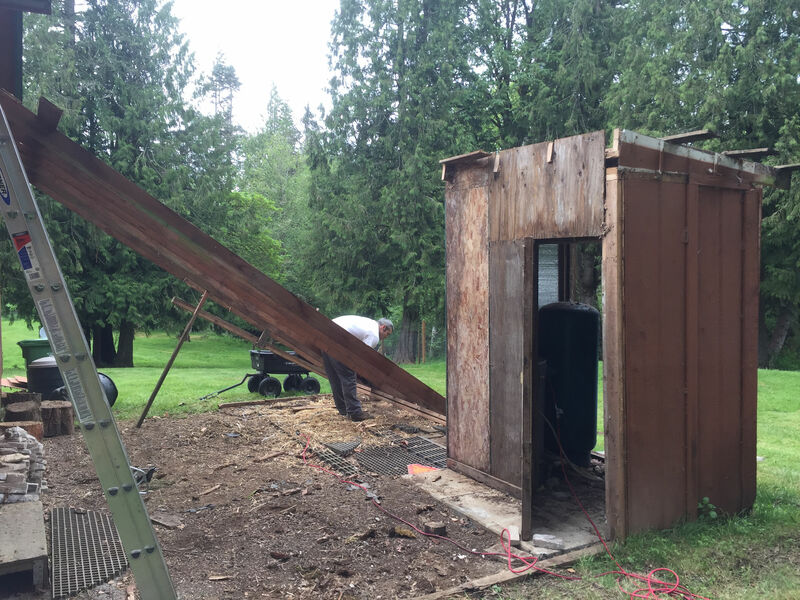 So the tear down had to be careful, and there also had to be a plan for a reconstructed pumphouse, to continue to protect the well. The demolition went quickly. 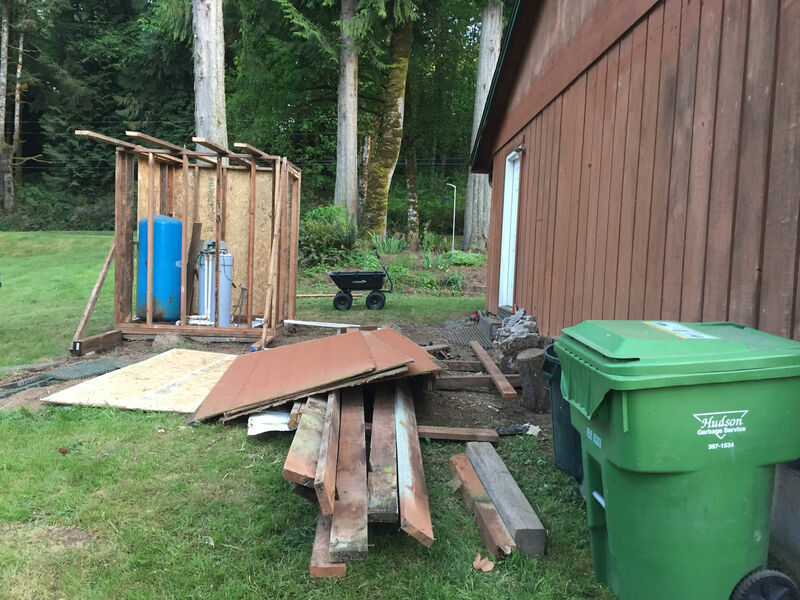 Turns out, the wood on the far side – away from the house – was completely rotten from both the wood sitting on the wet dirt for many winters, but also from a nasty termite infestation. There were also years of rats nests in the roof. The roof had actually caved in over the top of the well. I am *so* glad that disaster is no longer attached to my house, because the termites would certainly have made their way over. More deconstruction. 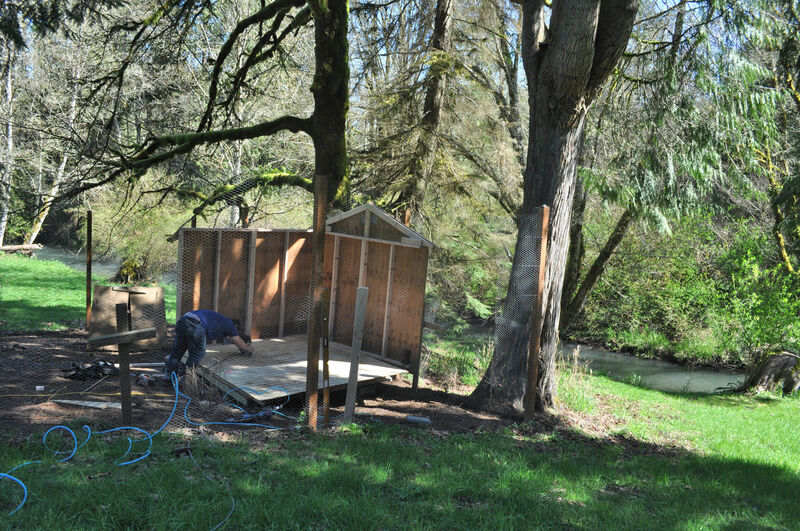 That’s the old well-house there behind plywood in the corner. Walls gone. Roof down. See the pile of bricks there at the side of the house? Those are what I used to build the front walk. Josh was carefully saving the good materials. 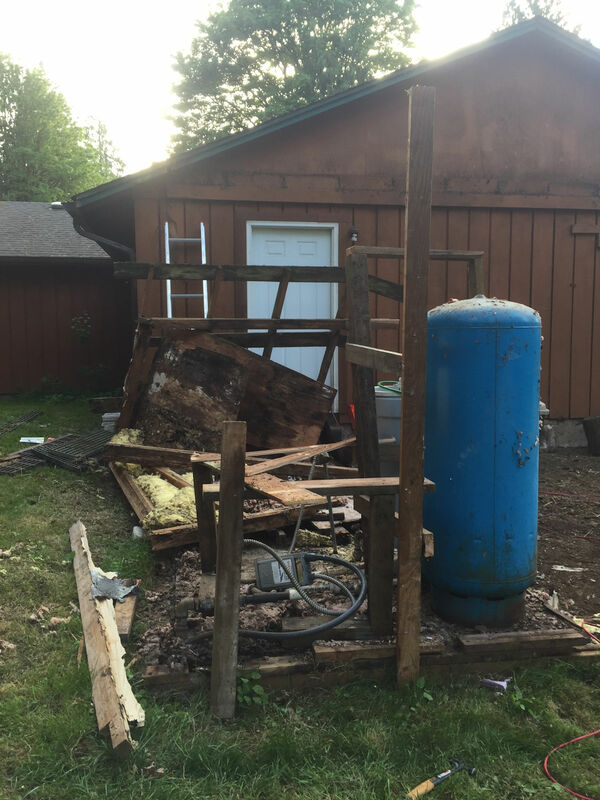 Here’s the water tank for the well, connected to an old broken water softener, and pipes and electrical wires all over the place. Ready for reconstruction of the pumphouse. 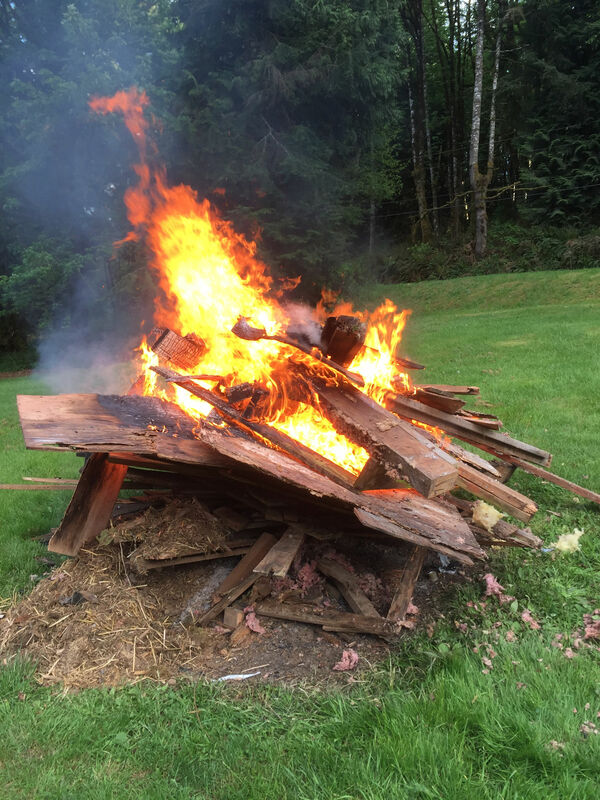 In early June we could still burn, so this is what happened to the rotten wood. 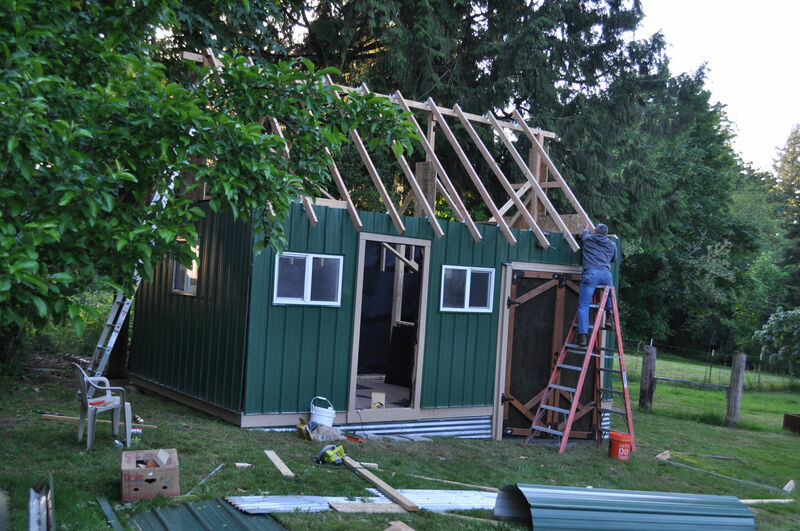 With barely a day to absorb the missing shed, Josh got to work on the rest. Someone at some point had installed a water softener next to the well. It’s a good idea. The water here is hard, meaning there is a high mineral content. It’s also high in iron and sulfur, so it has a mild rotten egg smell – yuck. But after three years I’m mostly used to it. The water softener was broken and taking up space. It had not been functioning in the three years I lived here. The benefits to having a functioning water softener are to minimize mineral buildup in pipes and to make showers nicer on the skin. But they also require maintenance, which I am not interested in. A reliable new one would cost a couple thousand dollars. I told Josh to get rid of it. Without the water softener, the pipes had to be re-routed. That was done in a day. 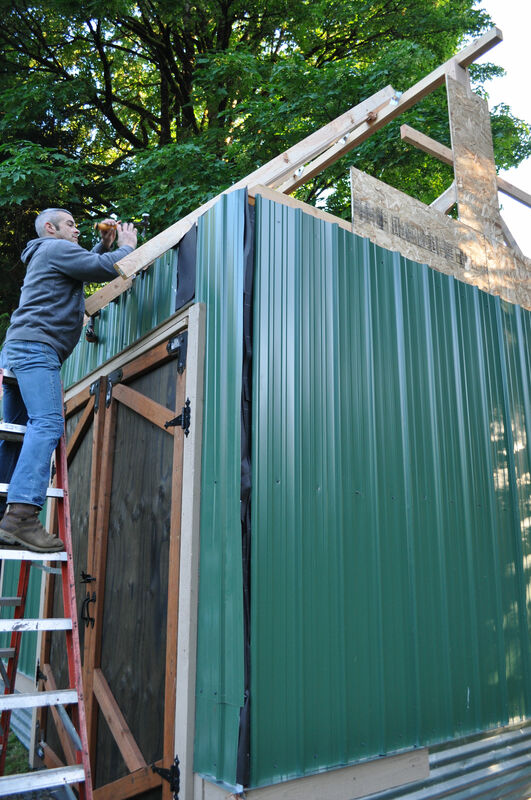 Then he built a pumphouse entirely out of recycled materials. 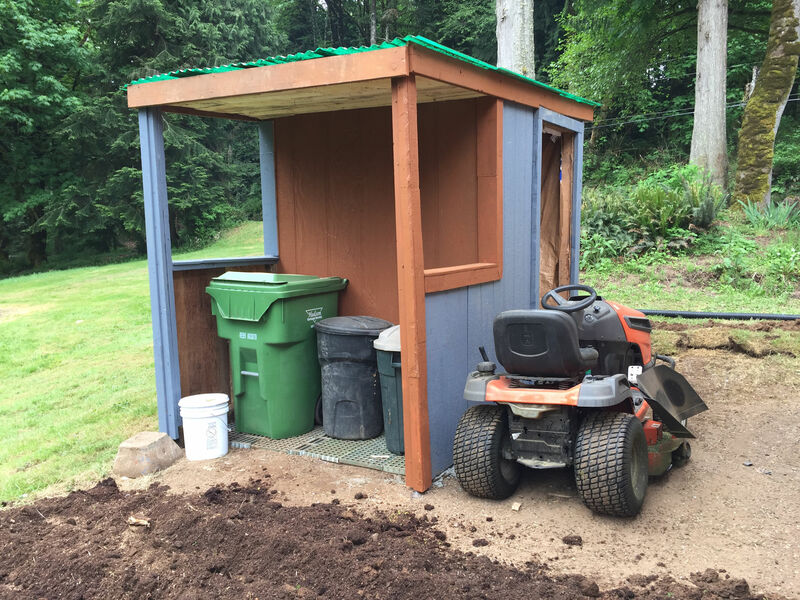 I asked for a roof over the back for a place to store my trash and recycling bins. 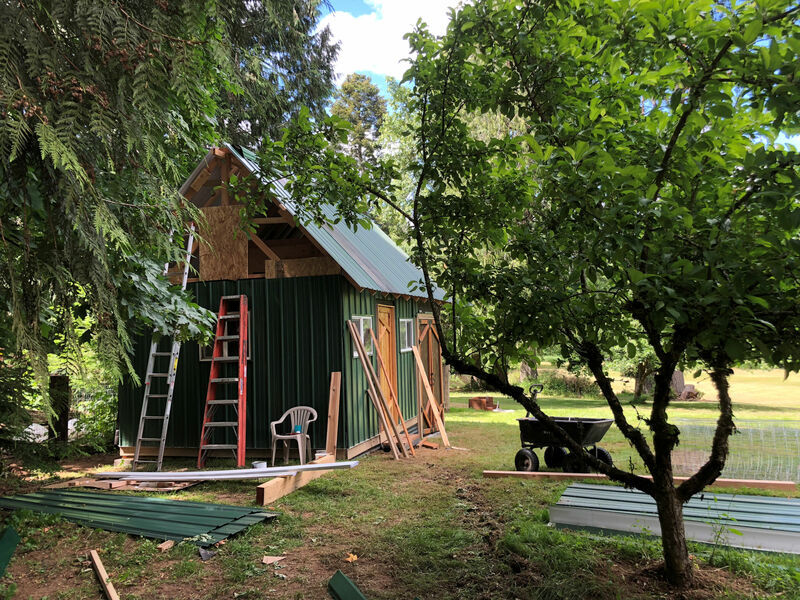 Since he was in there anyway, he put a spigot on the outside of the pumphouse, which is wonderful because I didn’t have water on this side of the house and had to buy a 100 foot hose to drag over here. Then he installed an outside outlet and some flood lights. This guy can do anything, I’m telling you. 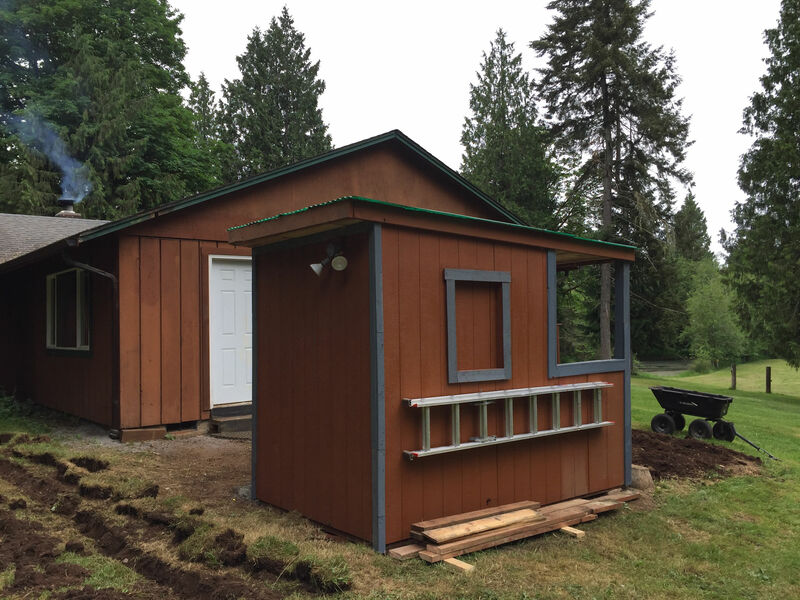 New pumphouse. You can also see the ground torn up, where he ran the drainage for the French drain from my driveway. View from the back, with my trash and recycling bins. 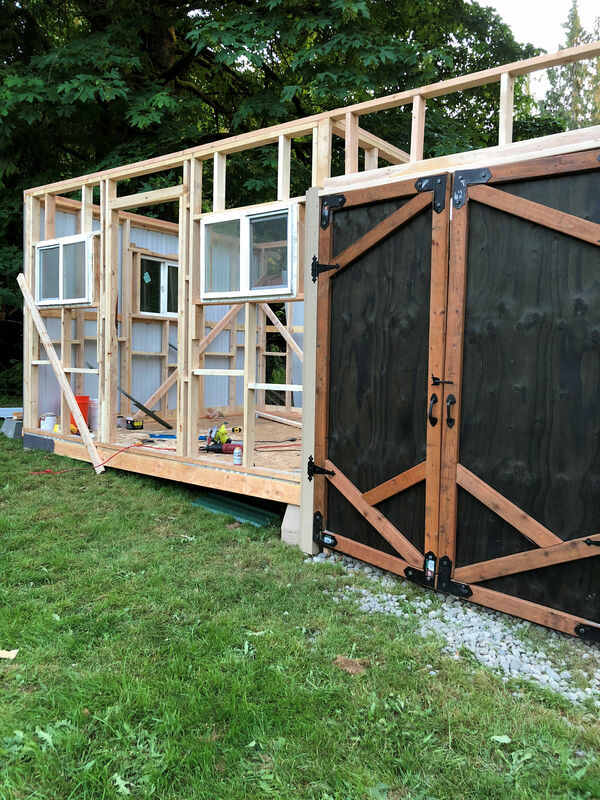 Now I needed a space to store all my equipment that had previously been stored in the shed. I pointed out the place where I wanted it built. Josh thinks about it for a couple hours, jots a materials list down on a piece of paper. I handed him my credit card and off he went to Home Depot. In no time, the place was going up. He built these doors from scratch. He adjusted the bottom to follow the slope of the land. They open onto a bed of river rock. I can just drive my riding lawnmower into it! Sooooo cooooooll! 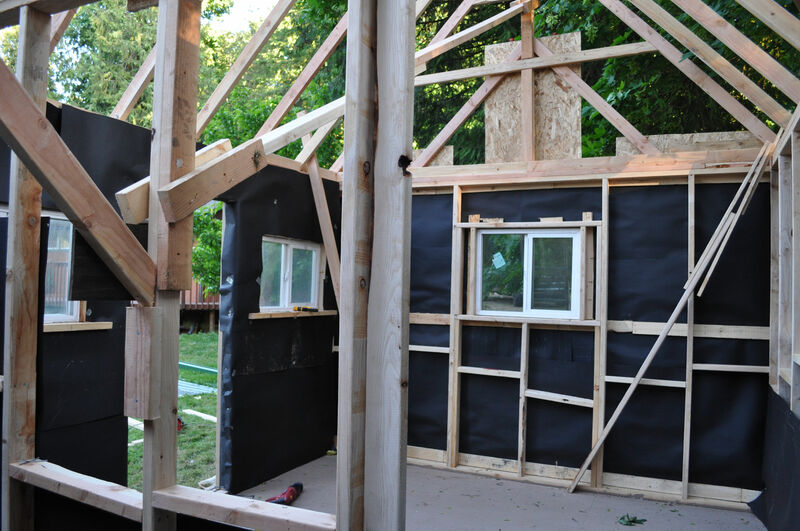 Tar paper up to provide a little insulation in the winter. This is the location. On the other side of my house, and completely detached. 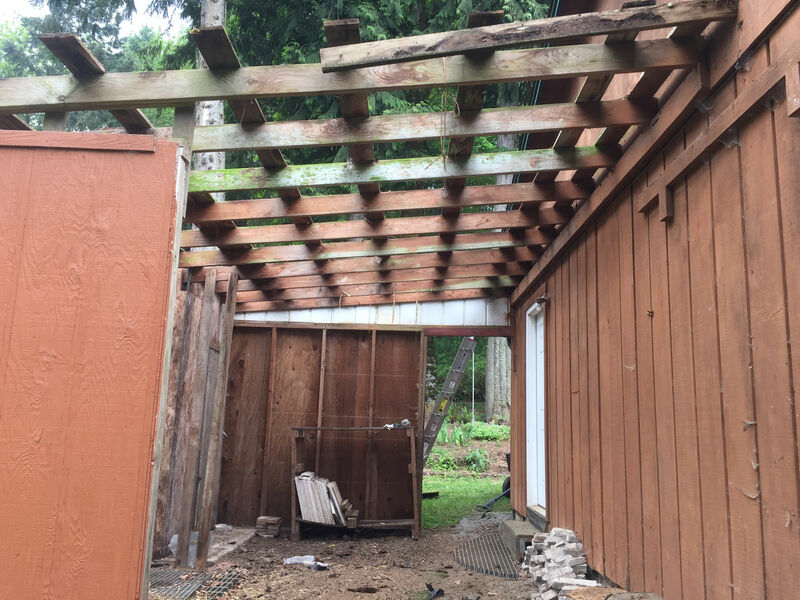 The roof was the hardest part. 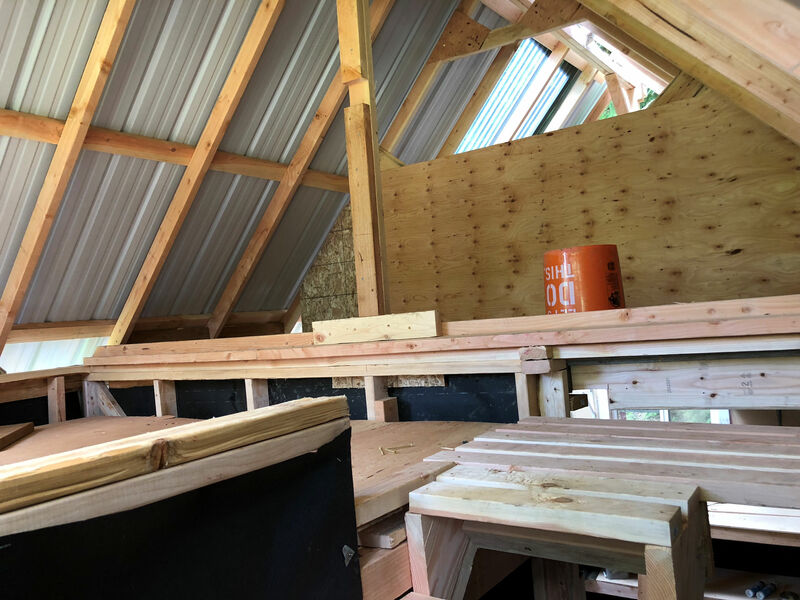 He built it steep for upstairs storage. Some of the roof pieces are clear, so there is a skylight. 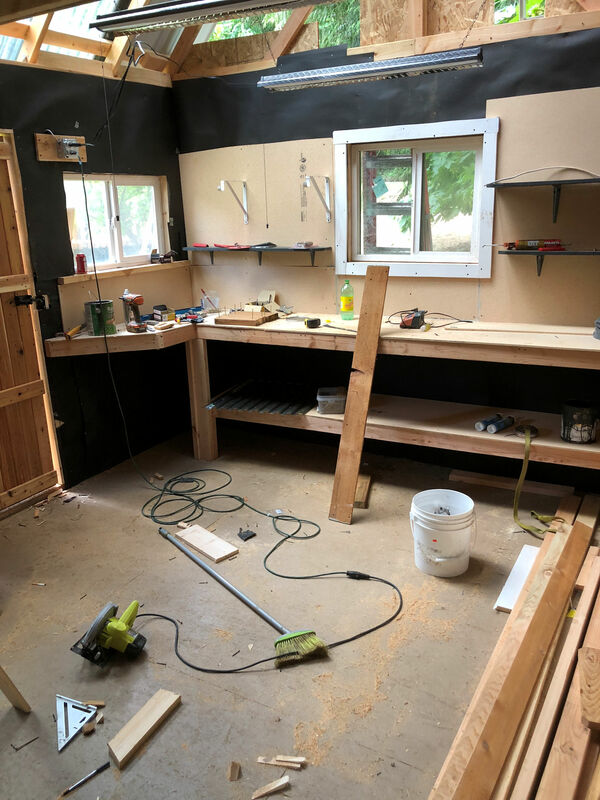 Inside, he built me a work bench. He picked up the windows at Habitat for Humanity, for $5 each. Stairs up to the storage area. 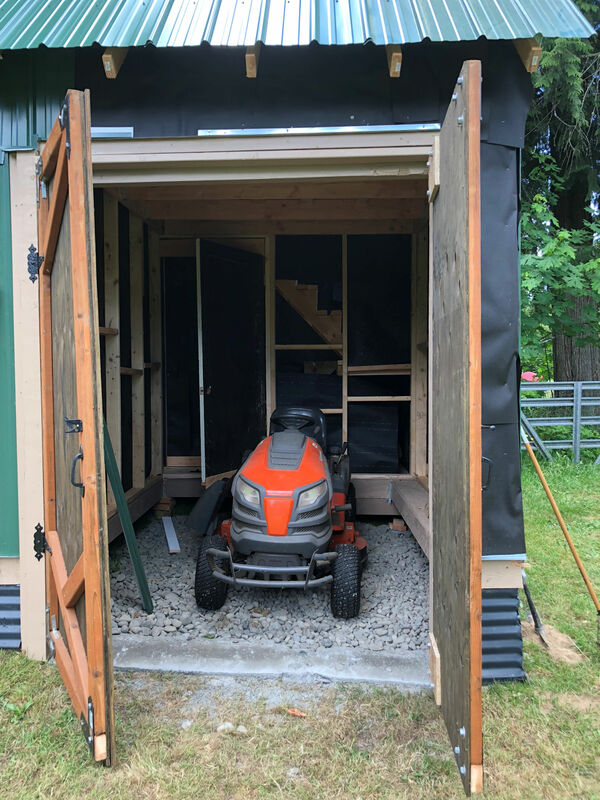 This is the storage area above the lawnmower parking area. Lawnmower has a new home. Evening sun lighting up the shop. This is my view from the deck now. It’s ready to be used. On a whim, he thought maybe the soil previously in the shed might be good for a garden. Josh planted tomatoes, green pepper, cucumber, and onions here. 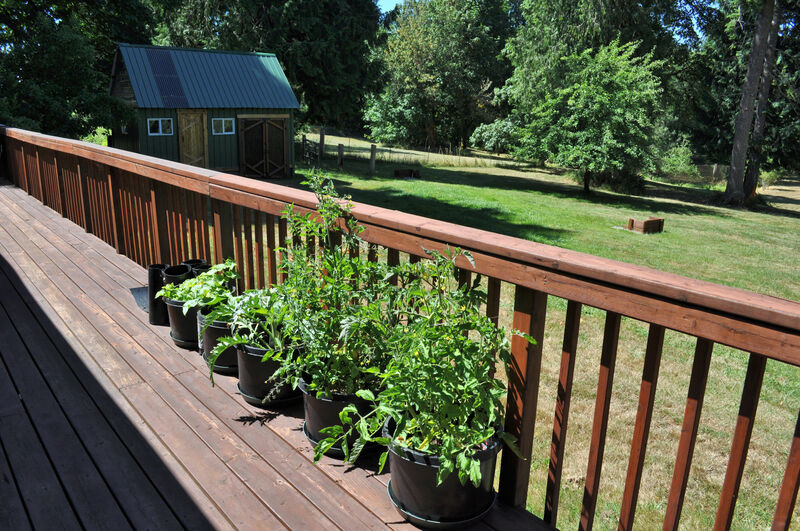 We’ve been harvesting the onions and cucumbers already, and the peppers are just about ready. 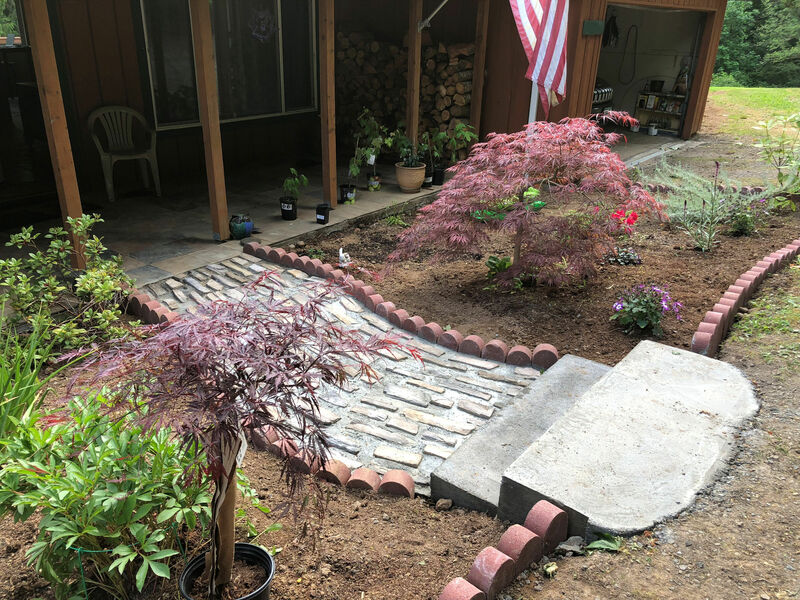 I built a new attractive front walk and steps to replace the ugly concrete slabs. Ever since Josh has been living here, things are getting done at a breakneck pace. I almost need a moment simply to absorb the changes. New front door with glass to let in light. Tara called him my Work Gremlin at one point. I came home from the office one day and the deck was stained. I glanced out my window from my home office one morning, and noticed a new, handmade bird house mounted on a tree. 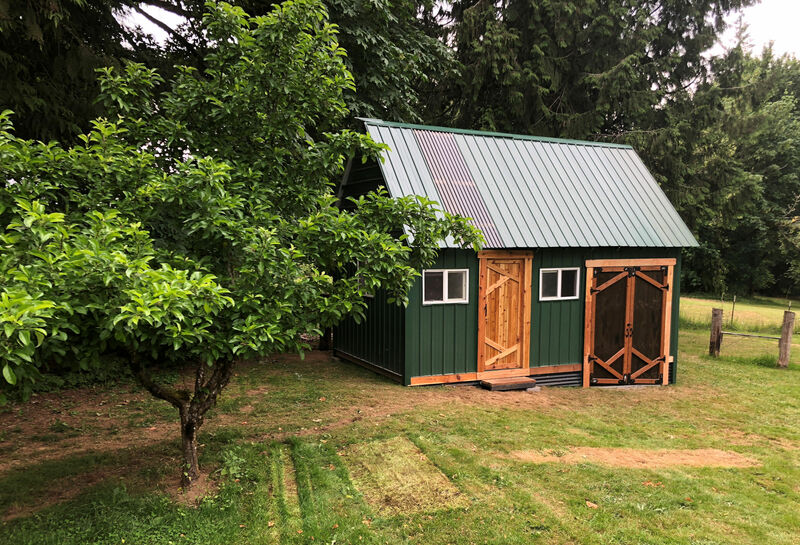 He cleaned the roof, repaired the gutters, then installed leaf guards. 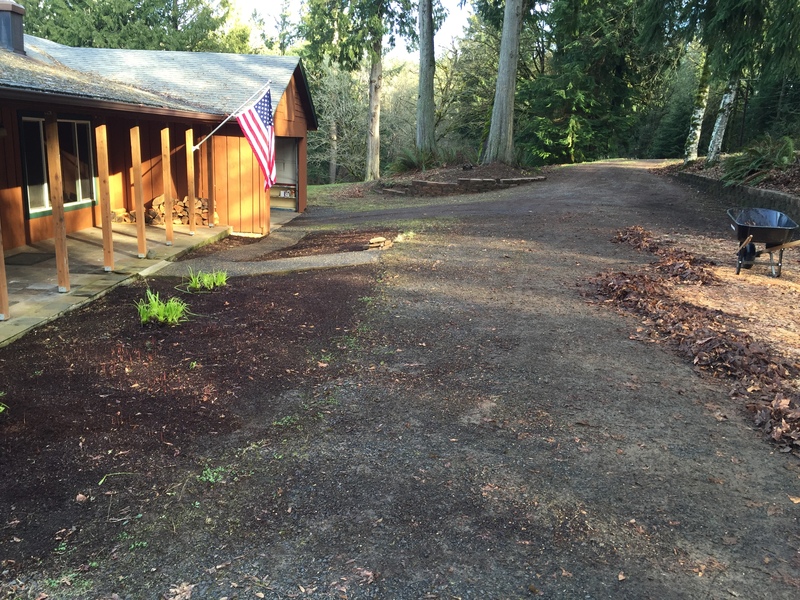 He borrowed a leaf blower and cleaned up the leaves, and heaped them all on the burn pile. He rakes, and power hoses, and organizes. He consistently takes the small push mower and mows the grass where there is no room for the riding lawn mower. Sometimes I ask for things, sometimes they simply appear. Josh isn’t able to pay me rent, but as far as I’m concerned, he’s paid up. 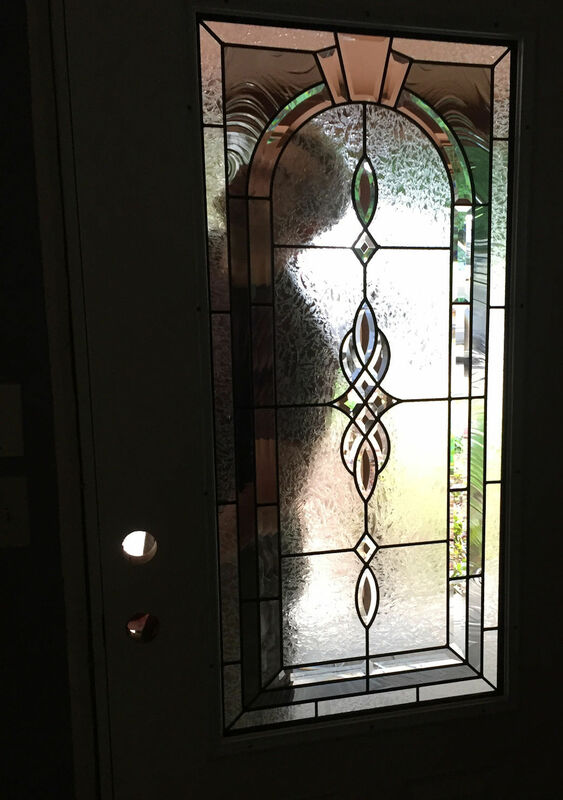 In my quest to bring more light to my cave-like living room, I purchased a new front door with decorative glass in it. I was quoted hundreds of dollars for the store to send someone out and install it. Josh said he could do it, and within an hour from when I brought the door home, it was installed. I complained one day about my sloping drive into the garage. 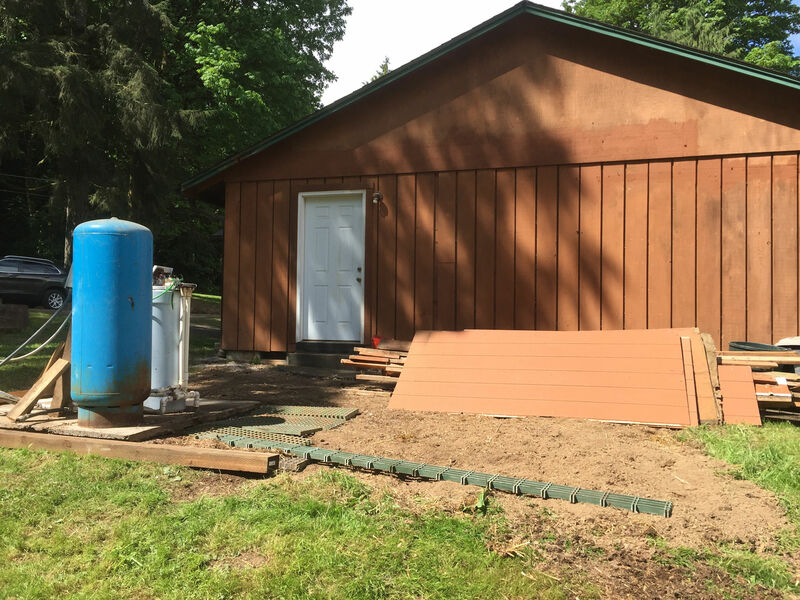 I said I had been thinking that a French drain might be a good way to address the problem of all the mud and rainwater and snow that slides down the slope into my garage. He said, “That’s a good idea.” And in a couple of days, it was done. 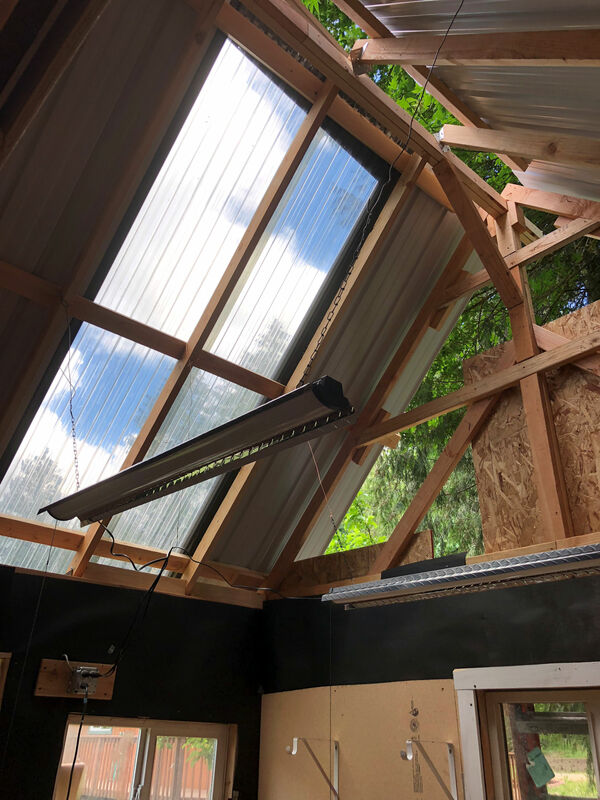 While he was at it, he also installed new weather stripping on the bottom of the garage door, and a rain barrier to the concrete floor, so it’s much better protected inside. Then he found some of the spare house paint, and painted the outside of the garage door that had been weathered down to bare wood. All the work on the garage door disrupted the open/close mechanism, because the size of the opening had changed. I found a YouTube video that addressed my brand of garage door opener, got a stool and got up on tiptoes, and reprogrammed my garage door. With this guy around, I have to do *something* to show for myself. 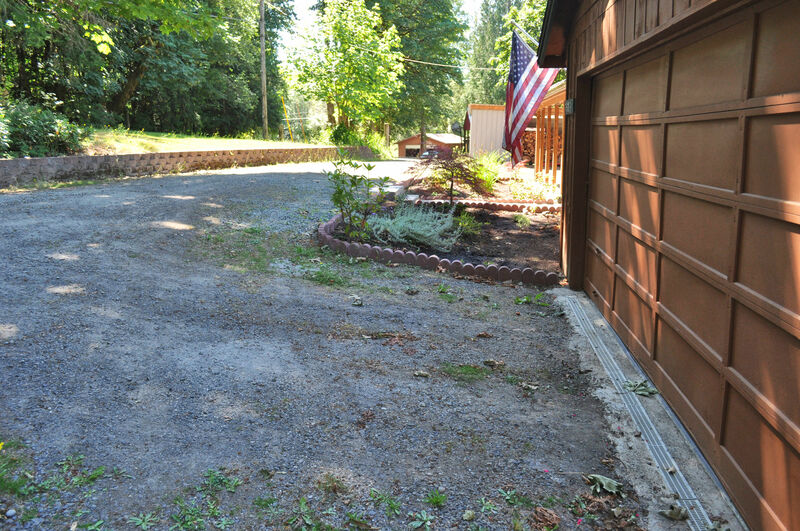 In front of the garage door, a drain is installed. Now, water that runs down the hill will fall into the drain, then run through an underground pipe into the yard. This photo taken in May 2018. I’ve always hated the concrete walks in front of the porch. I asked Josh one day to take the sledgehammer and bust them up so I could haul them away. It didn’t take him long to discover that these walks are six to eight inches thick! Whoever decided to pour such massive slabs of rock? ugh what a pain. Somehow, he got them broken into three huge pieces and drug them out of there, chained to his truck. Somehow, none of my plants were destroyed. That’s the real miracle. Since I moved in there has been a pile of bricks on the side of the house that are left over from when the previous owner built the rock fireplace inside the house. I had the idea of using those bricks somehow to make a more attractive walk. Josh showed me how to mix concrete, and soon I was up to my elbows in it and having a blast. 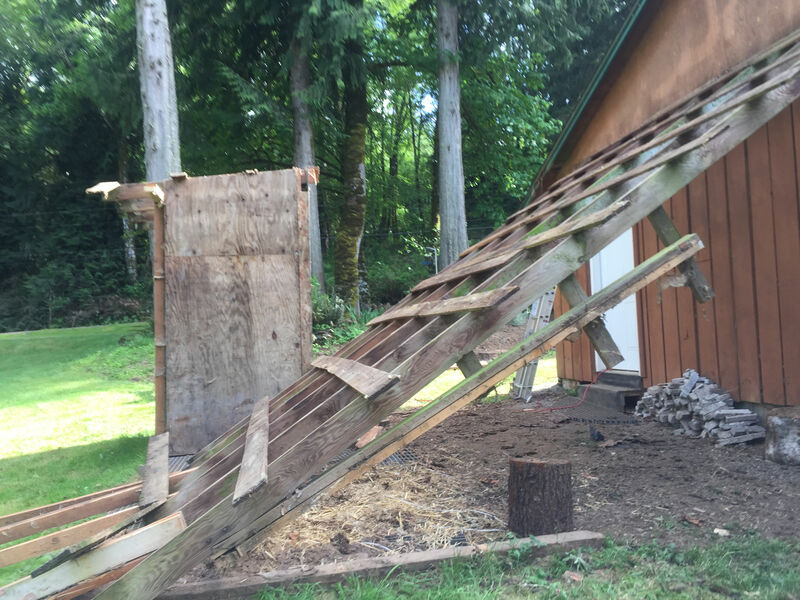 He built some forms for me to make steps, and then left me to do everything else. 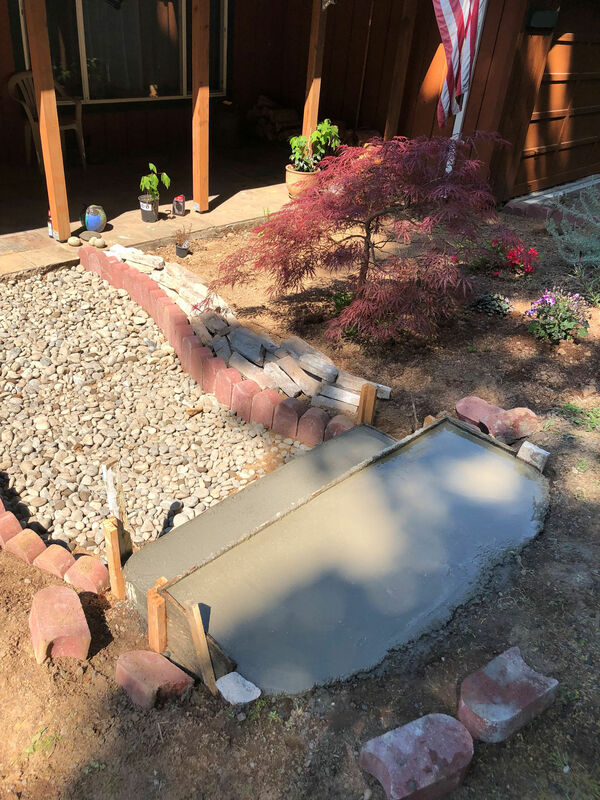 Steps are poured, and river rocks laid down before concrete is poured on the walk. 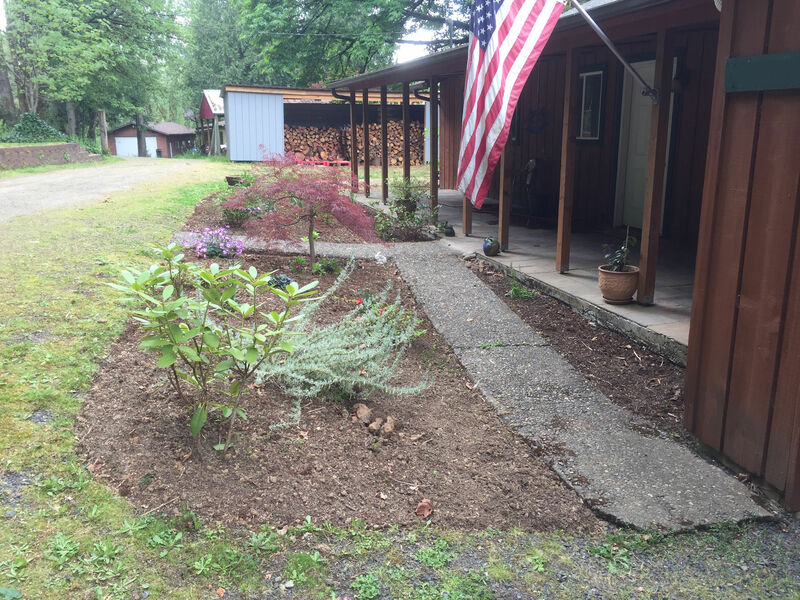 Looking from the porch toward the driveway. Isn’t this a hundred times better? 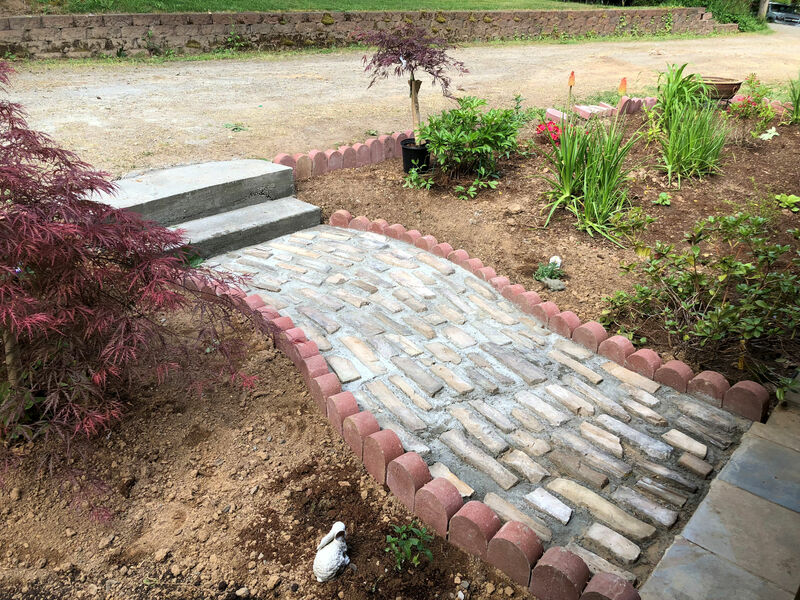 I’m so proud of myself for building this beautiful walk on my very first attempt at using concrete. Just wait till I tell you about the new pump house and new shop! 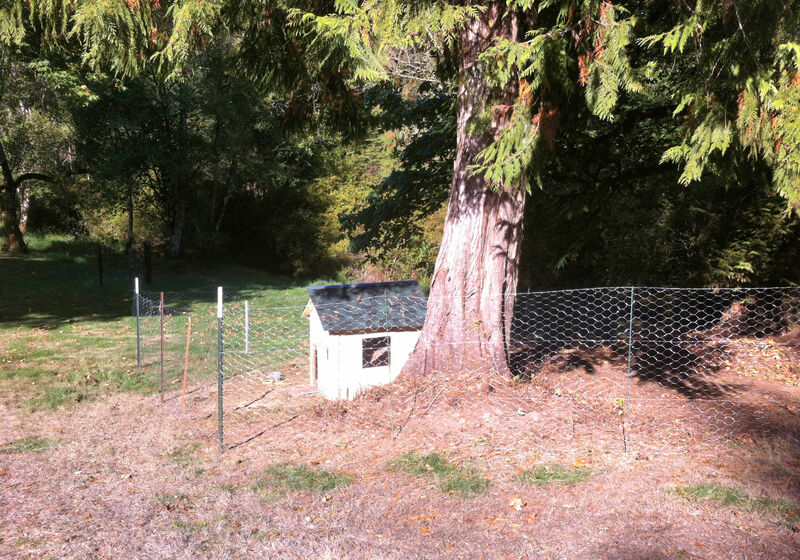 View of chicken pen and coop from my bedroom window. Look at that pretty little spike deer. Remember the Hussies? My chickens are still with me. Only three remain (Lacey was hit by a car, and I ate Gimpy), and I love them as much as I ever did. It was high time I demonstrated this. 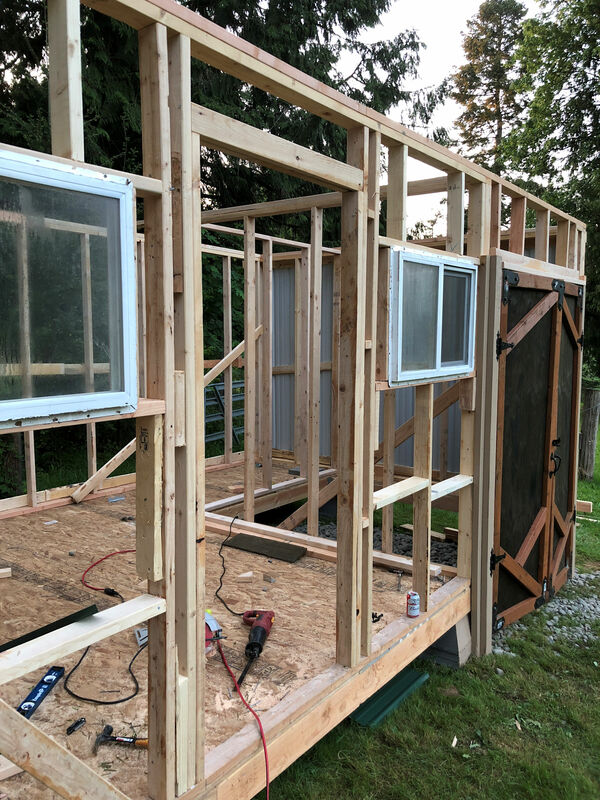 A friend of mine needed a place to stay and he is not able to pay but is the handiest of handy men. 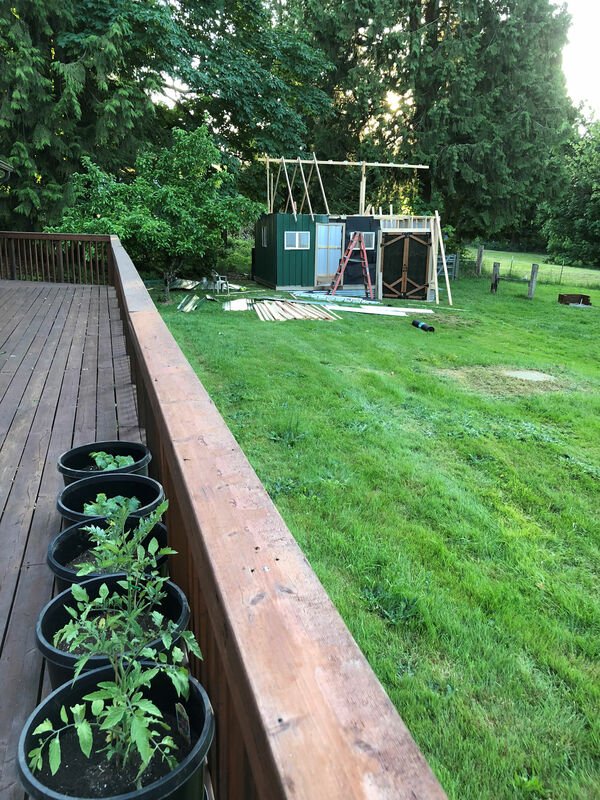 I live alone in a three-bedroom home on a big property and work full time so I don’t have extra time left over to take care of my big property. Obviously, this was a situation that could help both of us. Josh moved in the end of March and started helping me. 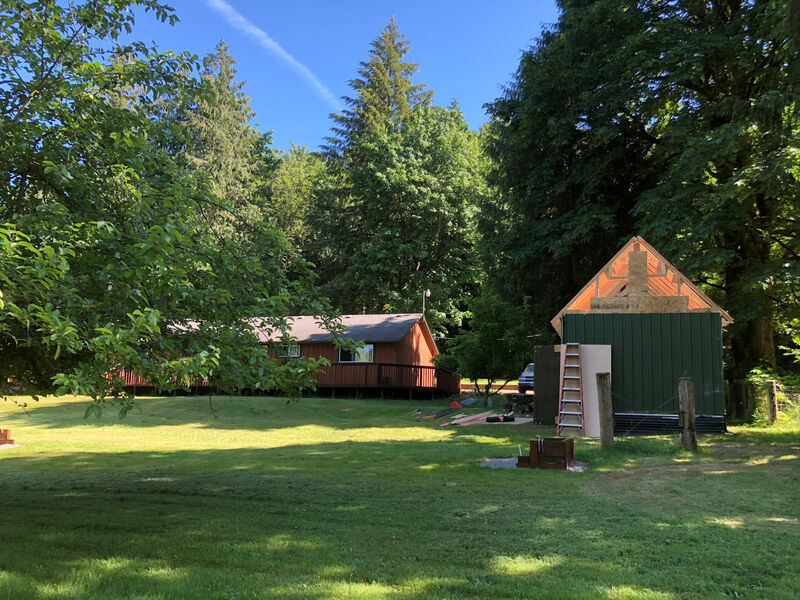 (You may remember Josh from our hike last October) The list of improvements ranges from finally having a towel rack installed in my master bathroom to constructing new buildings on the property! One big change is that my chicken Hussies finally have a decent home. At the beginning of March, I began some work before Josh showed up. 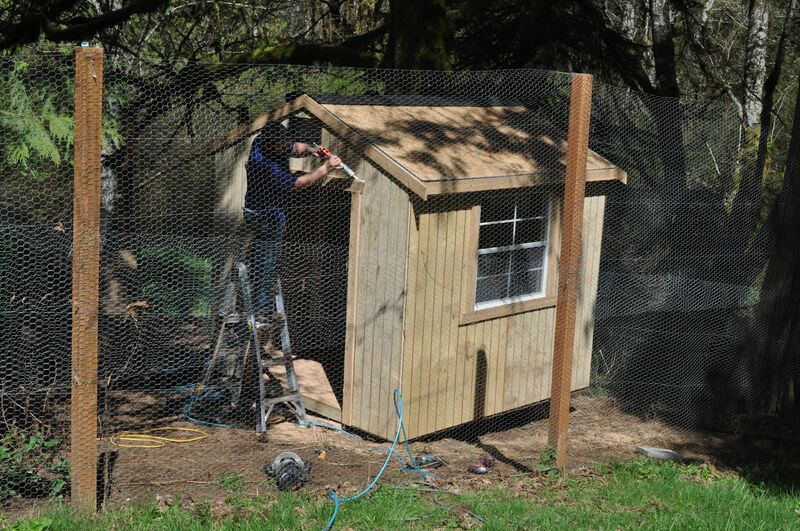 I hired some professionals and had a new chicken house built. 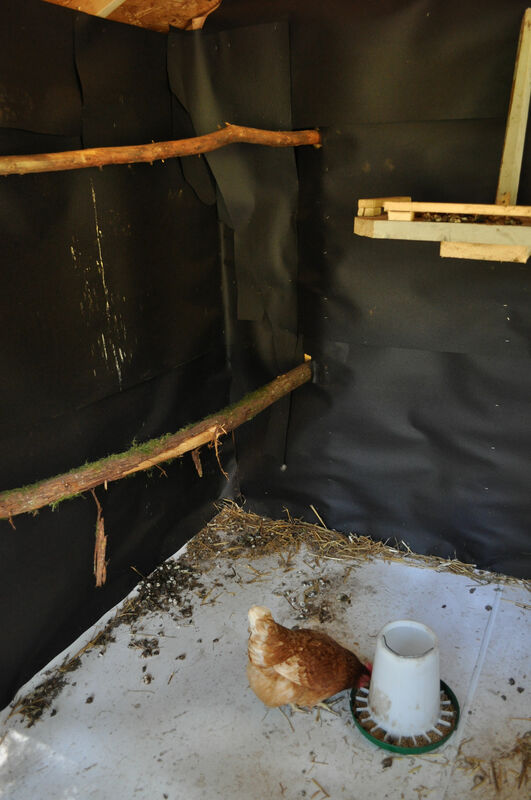 My poor hussies have been living in a tiny chicken house designed for chicks. 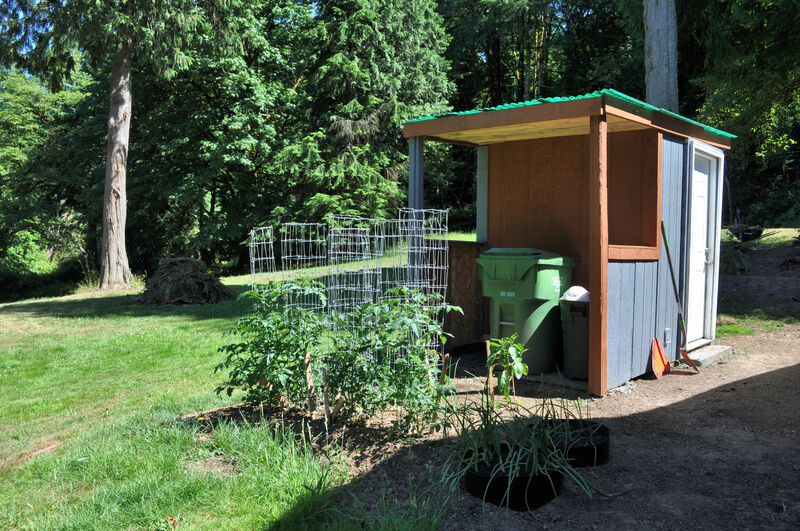 For two years they huddled in that tiny house and roosted and nested in the same space. Original chicken house, soon after I moved here. The beginnings of the new house lit up by morning sunlight, while the old house remains. You can pick it out behind the workman in blue. 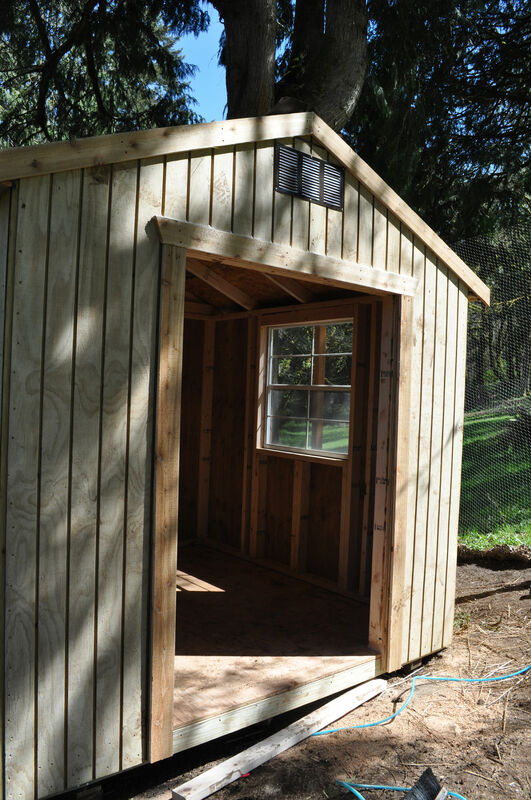 One of the first things Josh did when he arrived was to finish the chicken house. 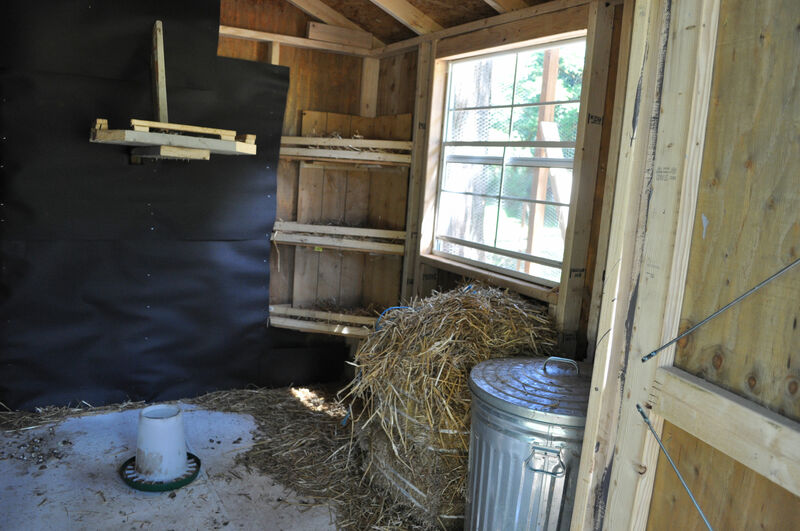 He installed roosts and nesting boxes. Installed moisture-repellent flooring for easy cleaning. 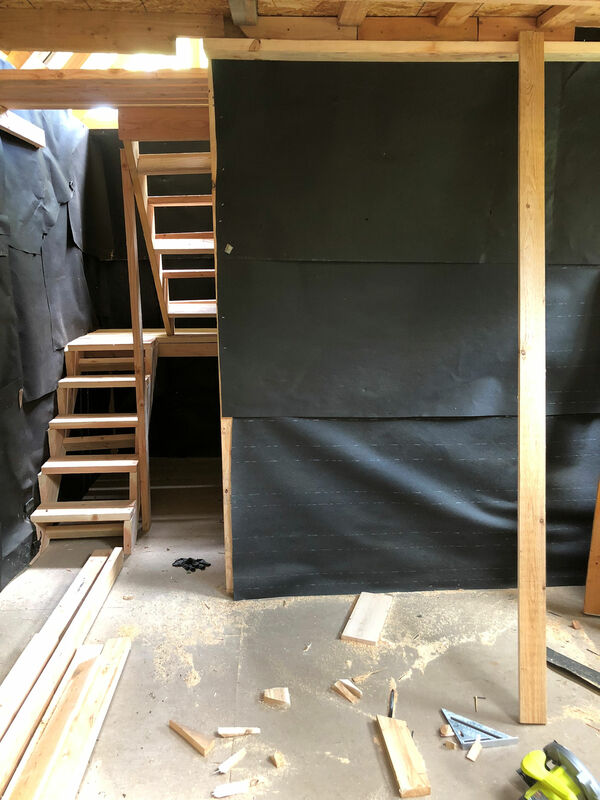 Covered the walls with tar paper (again, for easier cleaning). He painted it. 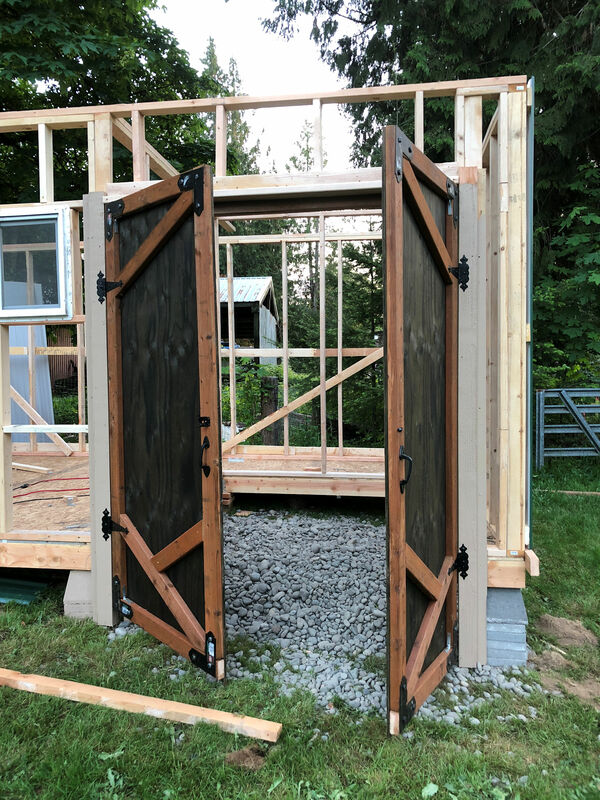 Josh had the idea to cut a little hole in the side and install the old ramp from their little house, so there is a special chicken-sized access door. Now they have a chicken palace, and they roost on the opposite side of the room from where they nest (translation: no more poop on the eggs). I can walk right inside! Open the window, fill their feeder, marvel at what a mess they make. 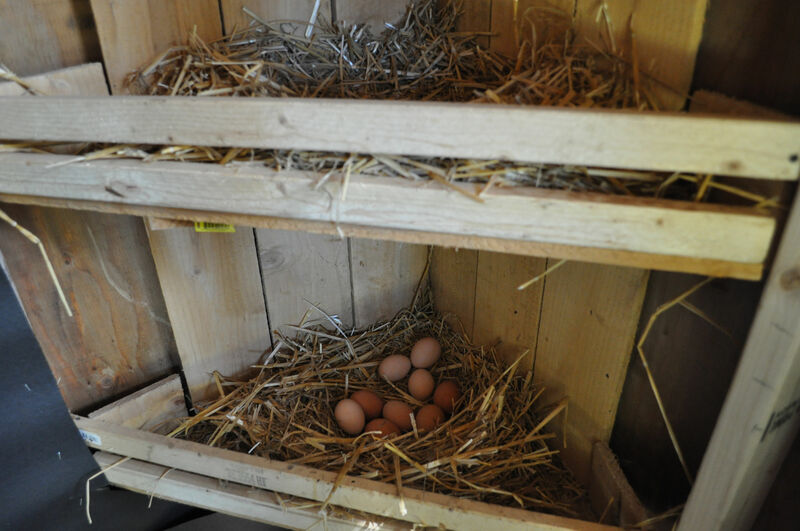 Eggs in the nesting boxes. 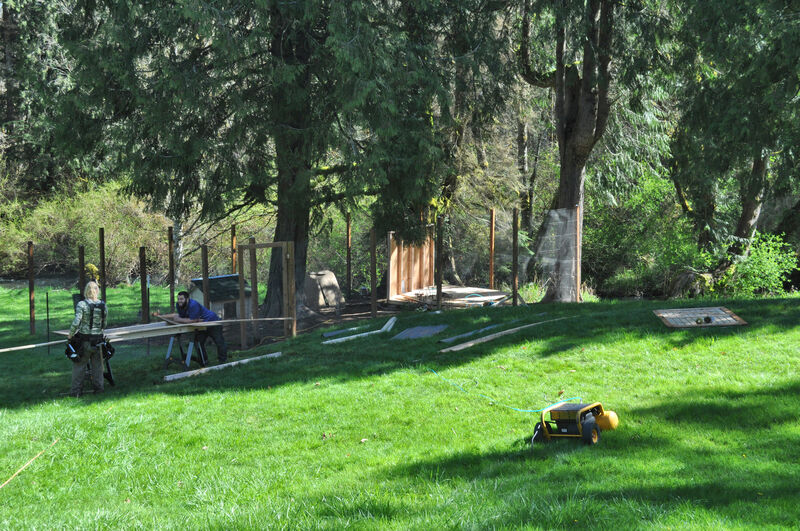 Stay tuned for updates on the landscaping, the pump house, the upcoming kitchen remodel… and more. My snowy home on a hill. I keep leaning toward complaints, but then I simply can’t follow through: this snow is spectacular. I live in the Columbia River Valley, just 45 miles from the Pacific Ocean. This tends to keep my little piece of Paradise green, even in the depths of winter. But Mother Nature has been on a cold bent lately. Well, heck, I can’t even say “lately,” because it’s been cold and snowy for a couple months now. I’ve lived in very snowy places most of my life, and so this doesn’t compare, but I am still enjoying it. Jamie and Phil after the big snow, when they were still interested in it. The ladies have had enough snow and are running for shelter. My chickens seem to be fine with it, but they do not like being cold. They hide in their little home most of the day rather than walk around in bare feet in the snow. They don’t eat much, leaving the chicken feed to the chipmunks. I expect to see some pretty fat chipmunks in the Spring. I need to go out each day, dump out a chunk of ice from their bowl, and refill it with water. They have also figured out that they can eat the snow. They also aren’t laying, and I do not blame them one bit! Who would want to produce a massive egg once a day in the freezing cold? Not me. 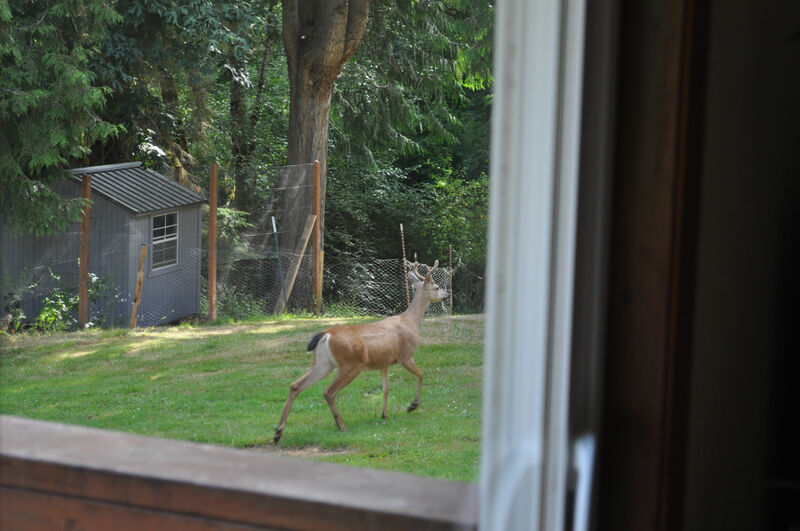 Looking past the apple tree into the neighbor’s yard. Beaver Creek burbles along gaily with no interruption. The sun came out for a few days, brilliantly lighting it all up. Those are my tracks in the foreground. I just can’t stay indoors when it’s this pretty out. My photos aren’t as good as I would like. My camera is still fried from my trip to Chile. I haven’t made it to a camera doctor yet. The weather has been so rotten that roads are sketchy, and it hasn’t been worth an hour+ drive into town. Also, I’ve been sick, sick, sick. Feeling much better now, but annoyed by this lingering cough to clear out my lungs. Sounds like I have COPD. Anyway, my iPhone camera is picking up the slack. I hope you enjoy the photos. It’s been pure winter deliciousness here. Evening sun making the treetops glow. I rarely need to, so I do not own a decent shovel. I found out that a blogger friend of mine was shorthanded on, as she put it, “young energetic people,” and I answered the call. Luckily it was pre-major snowstorm, and though cold, we did our work on a beautifully sunny day. The van was parked at the storage unit and we spent the whole day emptying the storage unit and filling the truck. It was windy, and when the sun dropped we nearly froze our patooties off, but we got the job done and went home elated and satisfied. It was discovered the next day that the truck had been loaded beyond legal weight and it had to be dismantled. That day I had to work and couldn’t help. TS inside the moving van. These tracks just melted my heart. I’ve got a little good news that’s probably exciting only to me, but I’ll share it anyway. I mentioned in November that I have posttraumatic stress disorder (PTSD) from military trauma. I’ll explain more about making disability claims with VA (The US Department of Veterans Affairs) later, but for now I’ll just say that I made a claim in 2008. The claim was denied in 2008 and again in 2009, so I appealed it in 2010. My appealed claim has languished for some reason. It’s still pending. I finally lost my patience and contacted my Congresswoman to stir things up a little, and it worked! Next week I will attend examinations in support of my claim. These consist of super-quick health evaluations not designed for treatment, but to assess the problem, then make an educated medical opinion on whether that problem could be related to military service. Then I wait around for someone to make a final legal decision. I’ll give it another year and then contact my Congresswoman again if necessary. Honestly, I think it has been long enough and my impatience is not out of line. If my claim is granted, any medical condition found by VA to be related to military service is then covered by VA for free. All doctor visits, medications, procedures. There is also a monthly stipend based on any loss of function determined to impact my employability. It would be a help. World made black and white. Playing with the sepia feature.